The Kayaksport Vivianne that I am paddling came with "gas pedal" type rudder pedals. While some people may prefer the way that these give them a more solid foot position within the kayak during forward strokes and rolling, I found a number of disadvantages with them. I could only move the rudder through about a 90 degree arc, about 45 degrees to each side of center. 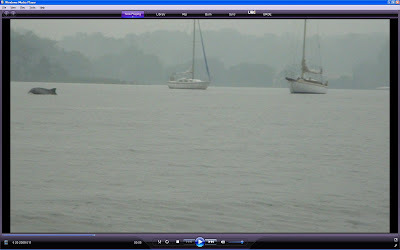 This was not enough to turn the boat in as tight a radius as the boat would be able to turn without this restriction. 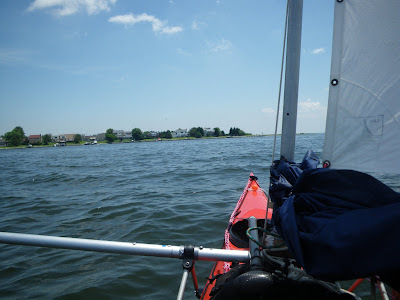 When kayak sailing, there are times when you need to hold a rudder in a set position off of center. Since the gas pedals required you to let up with one foot, but press with the other, this became uncomfortable for long periods of time. 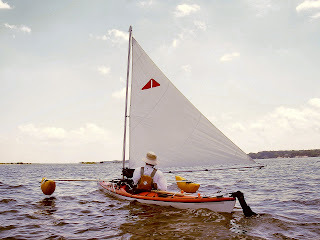 When paddling in confused seas, the slap of the waves against the rudder blade would cause the gas pedals to "twitch". A strange feeling to try to get used to. I ordered a replacement sliding pedal set from NRS. The sliding pedal set consisted of a plastic channel in which the aluminum sliding channel travelled. The pedals are attached to the aluminum channel and adjustable. Removal of the gas pedals was straightforward, involving only minor bodily contortions to get to the front bolts by climbing headfirst into the cockpit with a ratchet set. The new plastic channel aligned pretty closely to the holes in the gas pedal channel, and only a slight elongation of one hole was needed to accomodate the glassed in bolts in the boat. I decided that I would rather have the sliding pedal type of set up. A friend of mine had recently had his CD boat converted from gas pedal to sliding pedal, and the outfitter doing the conversion had difficulty due to the length of the glassed in rudder bracket bolts being too long and interfering with the pedal slide piece. I believe that they ended up making shims that lifted the plastic channel away from the sides of the boat. This allowed the sliding aluminum channel to clear the bolts. I didn't want to use this method, since it would move my foot positions closer to each other, giving me less foot room. Instead, I shortened the aluminum channels by about 50%, allowing the plastic channels to fit against the side of the boat and giving the aluminum channel enough free room to travel back and forth and still clear the boat when the rudder swung an arc of 180 degrees. The Vivianne uses non-stretch line rather than steel cable to connect the rudder to the pedals. Reattachment and adjustment was easy with a couple of knots. The new pedals now allow a much greater range of motion for the rudder, give me better control over rudder position, and have improved the handling of the boat. Paddling on the West river I came across a pod of porpoise. There was a group of about 6-8. First time I've ever seen them on the West. It was a great day to get on the water. 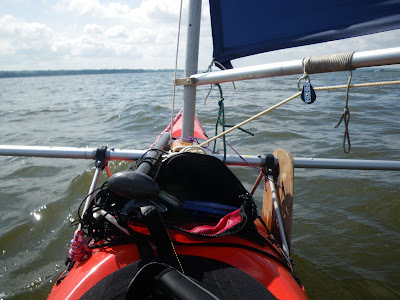 With a north wind, and a shuttle arranged, I did a 21 mile trip down the Patuxent river with the sail rig.